Steve Klein, Exploration 162, 2012. Kiln-formed, blown, and cold-worked glass. 18 x 18 x 7 in. 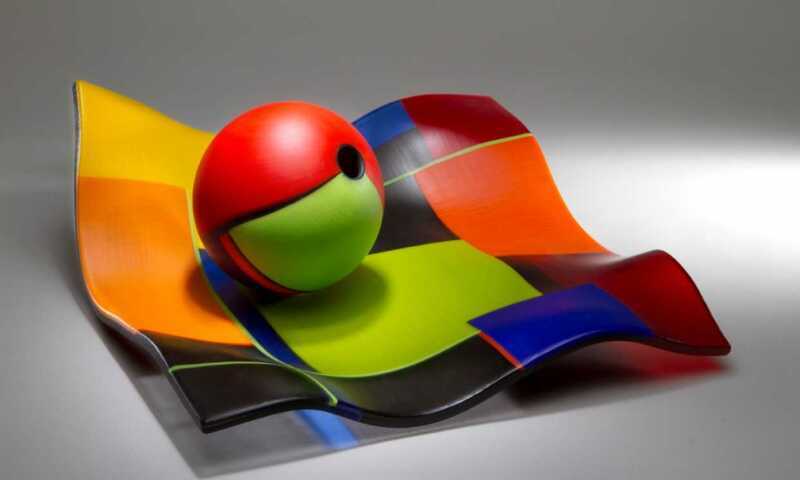 Contrasts brings together a selection of promised gifts from the collection of David Kaplan and Glenn Ostergaard that exemplifies glass as an artistic form. During the early years of the American studio glass movement, the sharing of techniques and ideas played a significant role in the young genre’s advancement. The pioneers of studio glass became teachers and mentors to a subsequent generation of artists whose independent thinking and contrasting approaches propelled the technical and conceptual potential of the medium forward. Today, contemporary artists continue to explore the creative possibilities of glass’s unique properties. Kaplan and Ostergaard began collecting glass because of the properties that captivate the eye, especially its play with light and reflection. However, they soon discovered that it was the contrasts among expressive and technical methods employed by glass artists that most inspired their appreciation. As their collection grew to include works from around the world, the wide-ranging diversity of practices emerged as a central theme. Contrasts brings together works by glass luminaries including Emma Camden, Steve Klein, and Nick Mount, highlighting the myriad of possibilities in making blown, cast, and kiln-formed glass.